Brazil possesses vast tracts of public lands, especially in the Amazon, which exist in the public domain. Traditional peoples, landless movements, quilombolas (communities established more than a century ago by Afro-Brazilian slave descendants), and other homesteaders have the legal right to lay claim to these lands. It is the job of state land tenure agencies to keep track of these public lands, regulating the allocation of land and property rights to secure protection for individuals and communities against forcible evictions, and to monitor against illegal deforestation, large illegal land grabs and other illicit activities. However, a recent study found that none of eight Amazonian states met all the mandated transparency criteria. Active transparency indicators (data accessible on the internet or via public documents) were missing 56 percent of the time. Passive transparency indicators (data available on request) fared poorly as well. The inefficiency of land tenure agencies in providing land titling information contributes to numerous land conflicts, and increases insecurity in the countryside. The lack of transparency also enhances the possibility of fraud. When the poor are deprived of rightful land title data, the wealthy often have the upper hand if land disputes go to court. 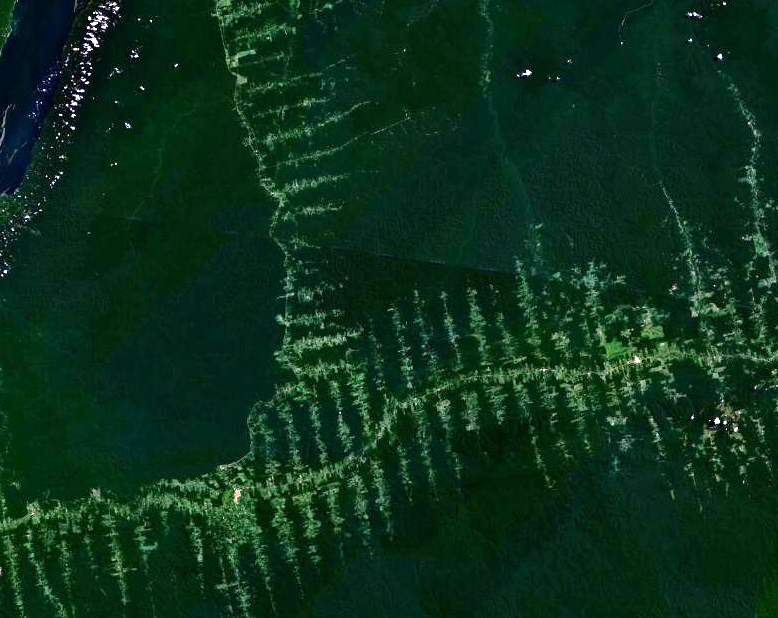 Illegal deforestation in the Brazilian Amazon. Image by NASA via Wikimedia Commons (Public domain). Brazil’s Pará state includes a vast area of public lands the size of the U.S. state of California — roughly 450,000 square kilometers (174,000 square miles) — tracts not classified as national parks or indigenous reserves, but held in the public domain. Would-be legal occupants of this government property (including traditional peoples, landless peasants, or other homesteaders), who wish to build on these lands, or want to take out land-related loans, or simply need to ensure that they can continue to live where they are, need official recognition of their land tenure status. The recognition of land titles on these public lands is determined via land title records maintained by state land tenure agencies; information that must by law be accurate and made legally available to all members of the public in order to prevent land disputes. However, a new study highlights a serious lack of transparency by the state land tenure agencies, and found major failings in their provision of access to data related to claims on public domain lands. Of the eight Amazonian states studied (Acre, Amapá, Amazonas, Maranhão, Mato Grosso, Pará, Roraima and Tocantins), none met all of the mandated criteria for transparency. Pasture in Brazil. Image by Rhett A. Butler/Mongabay. It is very important that land tenure agencies be able to provide clear, accurate and accessible information to the public to assure efficient and fair management of public lands. These institutions regulate the allocation of land and property rights in order to secure protection for individuals and communities against forcible evictions, as well as monitoring against activities such as illegal deforestation and large illegal land grabs. The 2011 Law on Access to Public Information (LAI) mandates that information produced, managed and stored by states concerning all public lands must be readily accessible to the public. But Imazon’s comprehensive, 118-page study finds that this isn’t the case. The researchers attempted to test for both “active” and “passive” transparency with regard to access to information such as location of public lands, lists and maps of real-estate applications, and land titles already issued. Active transparency refers to data made accessible on the internet or through public documents by the state land tenure agencies. Active transparency indictors were missing from records an average of 56 percent of the time, the study found. The state of Tocantins had the worst performance on this score (79 percent), while Pará scored highest (29 percent). Passive transparency means that the information is available upon request to the agencies, who must respond within 20 days. To evaluate passive transparency, the researchers sent messages through the electronic Citizens Information Service (e-SIC) platform and physical letters through the post office. In the case of the e-SIC platform, the agencies in five states, excepting Acre, Roraima and Mato Grosso, responded within 20 days. In the case of the letters sent, most agencies didn’t respond at all. One of the requirements for securing land tenure is that people be living on the property in question. However, disputes can arise, and fraud can occur when, for example, wealthy land grabbers employ poor local people who falsely claim they are occupying the land, when in fact they are only temporarily occupying the ground while deforesting it. A herd of cattle in the Amazon. Image by Rhett A. Butler/Mongabay. 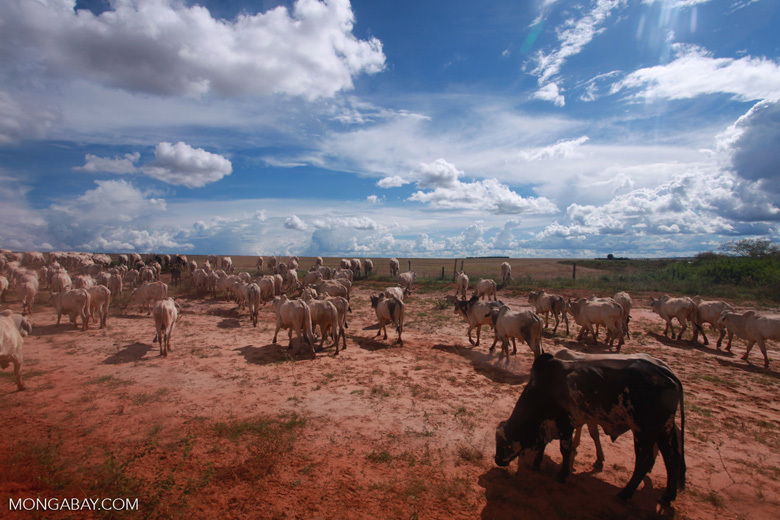 Most public land occupation in northern Brazil is driven by cattle ranching, the nation’s largest contributor to illegal deforestation. 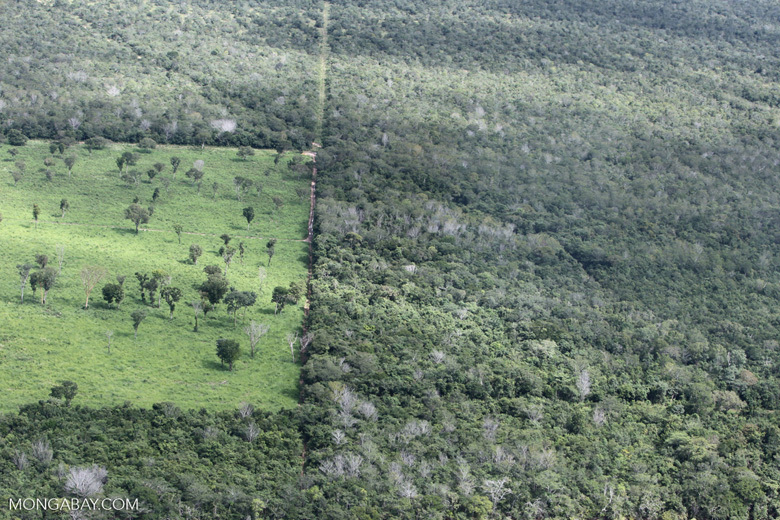 In the Amazon, more than 60 percent of deforested land is used for pasture. Inadequate state land tenure agency transparency regarding property ownership has helped facilitate this illegal land occupation, as well as illicit activities such as deforestation, to flourish. It has also resulted in rightful property claimants being pushed off their lands. Beyond the environmental impact, this rural land insecurity has other dire implications. According to records kept by the Pastoral Land Commission, an arm of Brazil’s Catholic Church, there is a land conflict-related murder in Brazil every 12 days on average. “Transparency in information involving public assets and resources is the best defense against fraud,” he added. Some issues preventing transparency include out-of-date agency websites and a lack of settlement maps, including maps of territories occupied by quilombolas, Afro-Brazilian runaway slave descendants whose legal community land rights were recognized in 2003. There are other transparency problems too: in one case in Pará, a building where land documents were stored was closed due to structural safety concerns. More seriously, in Mato Grosso, the state decreed that the land database be inaccessible for an indefinite period, despite the federal transparency mandate. Despite these major limitations, researchers say there are efforts and initiatives underway to increase transparency. They’ve called on the new government, which took office at the start of this year, to make access to land information, especially information about the titling process, a priority. Banner image of a patchwork of legal forest reserves, pastures and soy farms in the Brazilian Amazon by Rhett A. Butler/Mongabay. Cardoso Jr., D., Oliveira, R., Brito, B. 2018. Transparência de órgãos fundiários na Amazônia Legal (p. 116). Belém: Imazon.